The forest trees of Eastern North America are justly famous for their fall colour and Acer rubrum ‘October Glory’ is one of the best. 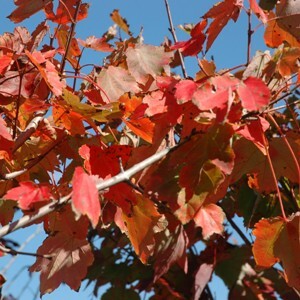 The species A. rubrum has the largest continuous range of any Acer along the Atlantic coast of 1600 miles from North to South. The sap of Acer rubrum is a source of maple syrup, but harvesting can only occur for a brief period compared to the sugar maple (Acer saccharum), therefore it produces a smaller yield. Acer rubrum is a useful tree, being reasonably fast growing, not too large at maturity and tolerant of wet soils and atmospheric pollution. The appropriately named Acer rubrum ‘October Glory’ is an American selection with exceptionally fine Autumn colour!